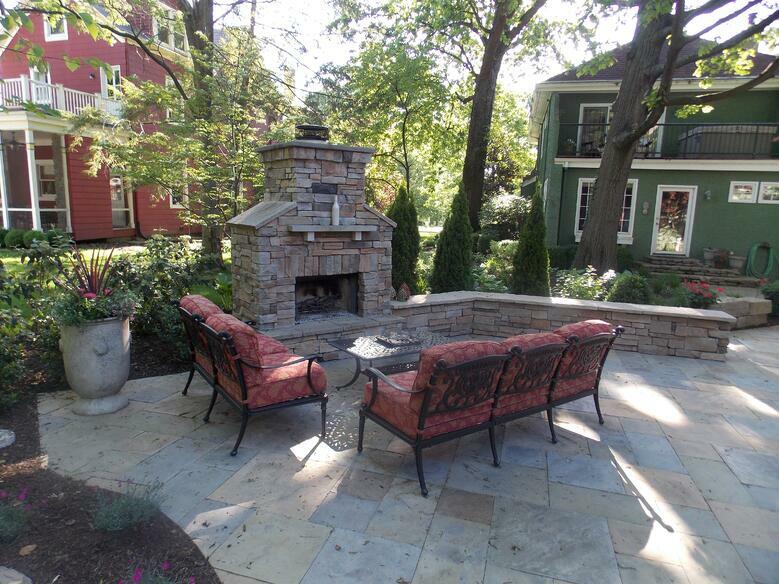 In a previous fireplace design blog post, we reported that outdoor fireplaces and firepits were in hot demand in Greater Cincinnati, and we can state now that this shows no signs of stopping. Having a fire element in your home's outdoor spaces allows you to extend to their use earlier in the spring and further into the summer (and depending on the type of winter we're having, even during the holidays). Whether you opt for a wood-burning or natural gas option will largely depend on how you wish to use it (and whether obtaining and storing wood is a possibility for you), but either of these choices can be designed in such a way to fit the character of your landscape and the needs surrounding it. 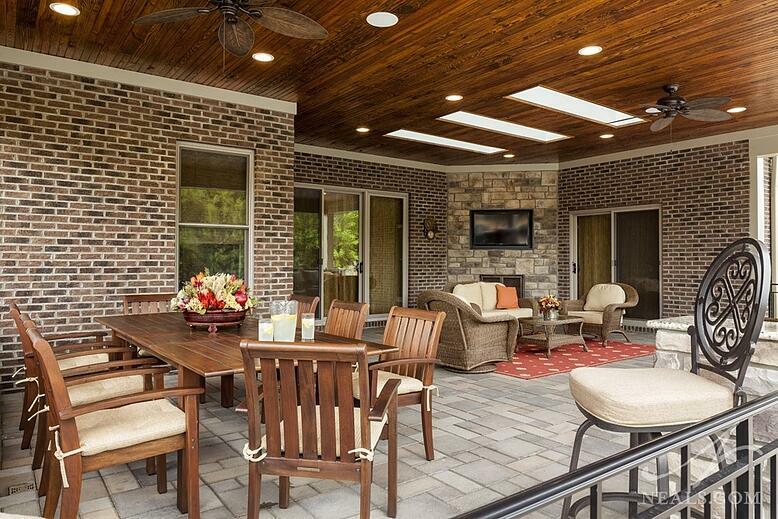 In this covered patio in Sycamore Township, below, a stone fireplace with a wood burning unit makes up the anchoring wall of the overhead pergola-style roof. More than that, however, it provides a privacy buffer from the backyard views of the neighbors without forcing the entire patio to be closed off. A long hearth doubles as a bench for extra seating. In the case of this outdoor living room in North Bend, the wood burning fireplace is part of a corner column that holds up the roof as well as provides a barrier to conceal the driveway, maintaining a pleasant view from inside. 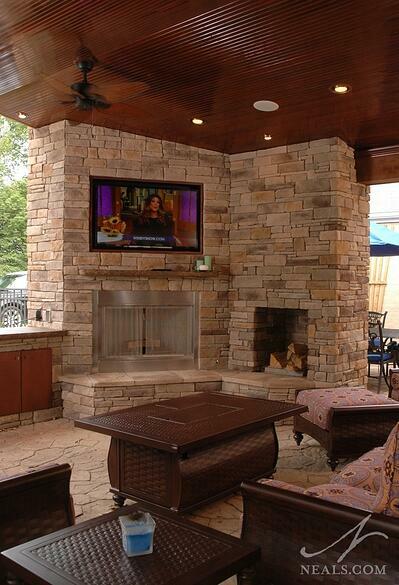 As a central focal point in the space, the stone column holds the fireplace and the TV in equal measure. Sometimes a fireplace doesn't need to be a focal point to be useful. In this Blue Ash porch project, a fireplace in the back corner of the covered space adds a way to heat the porch and add some ambiance for evening entertaining. The scale is just right to do the job and add a bit of architectural interest to the corner without overwhelming the space. In this extensive backyard transformation in Bridgetown, the best place for a fire element was in an open patio between the covered area and the pool. 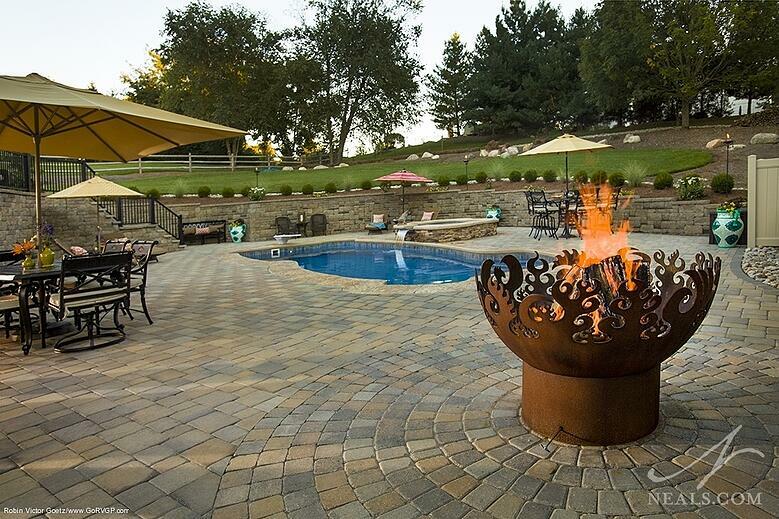 In this case, an artisan gas fire ring adds a playful quality, and provides another area for guests to gather for late-night summer pool parties. Note also that the stonework of the patio creates the zone around the fire ring to provide a visual clue that inside the circle, it's important to pay attention and be safe. 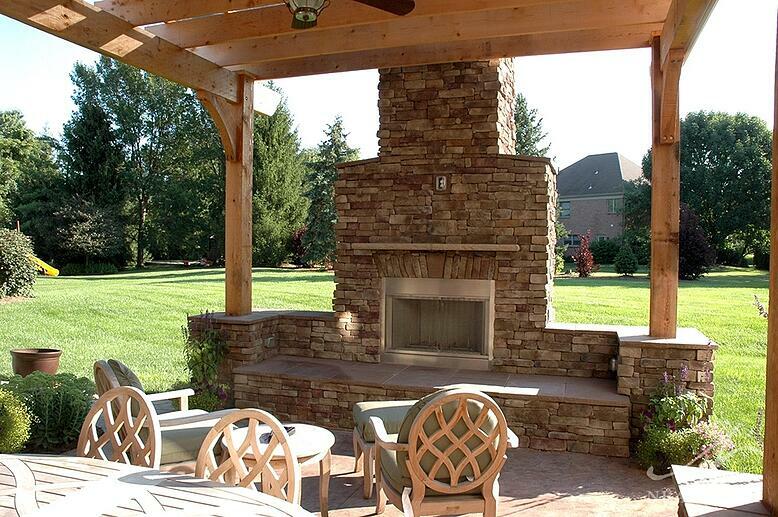 In this outdoor living project completed by Werbrich's Landscaping, the wood-burning fireplace creates a rustic stone stack at the end of a short border wall on the edge of the patio. The simple design matches the character of the back yard, but details like a hearth and mantle, along with the shaped top, make a sophisticated statement.